Nestled along the Ionian Islands of Greece, Corfu is an ideal travel destination for explorers who want to unwind and enjoy the beach, observe its nature, understand art, history, and culture on its landmarks, monuments, and historic museums, and the best part of it all; mingle with the locals and immerse oneself in Corfu’s pulsating nightlife. For a good start, visit the Old Fortress of Corfu; it is surrounded by water on all sides and the first thing you see is a nice little harbor filled with small boats. Inside the fort there are both modern buildings and remnants of the old medieval period. When you move up to the top, there is a beautiful view of the entire city all across to Albania and the Greek mainland. In case you want to enjoy some sunshine on a tranquil shoreline, prepare yourself for a thrilling climb via “donkey pads” to reach the Paleokastritsa Beach. It consists of four contiguous beautiful bays that attract tourists for its romantic ambience and the boat trips made in several caves. The rocks, the beaches, are not very large, but this part is always crowded with young people who like to party and tourists who want to see the fireworks spectacle at night. Highly recommended is to drive your car all the way up to the Lacones and find one of the many restaurants and see the breathtaking views of Paleokastritsa and the mountains that surround the city of Corfu. The spring season (March to May) and the season of fall (September to November) are the ideal months and seasons to enjoy a holiday in Corfu. The spring season is characterized by good weather, calm sea, and less crowds of sunbathers and beach revellers. The clear sky makes any outdoor activity more fun and thrilling to experience. Just take note of the increased tourist arrival before the Easter season (April) when Christians need to observe their faith and flock to sacred structures first, then head out to the beach area. It is advisable to book your accommodation at least a month in advance to ensure you’ll have a comfortable place to stay during the peak season. The fall season is the best time to explore the Mediterranean Sea in activities like; snorkelling, swimming, boat tours, and sightseeing around the city. The temperature around this time is in the low of 80s up to 50s. The city is blessed with good weather all year round and there are no extreme weather conditions, but most tourists avoid the winter season (December to February), because nothing much can be enjoyed outdoors like; swimming and snorkelling in its row of beaches due to the cold water and chilly atmosphere. Winter is also the wettest time of the year because of the frequent rains, especially towards the evening. On the other hand, the summer season (June to August), aside from having temperatures that soar up to 80s, it is vacation time for school and when most families plan their beach outing and tours around the major attractions of the city, so expect long lines, fully booked hotels, and too much crowd at the beaches of Corfu. If you don’t want any inconveniences during your travel avoid the summer and winter season. The Church of Saint Spyridon is a Byzantine church in the middle of the busy tourist town of Corfu. Outside the church there are many shops selling candles and other religious stuff. The candles can be lighted outside in a place provided for that purpose. It's fun to frolic around it before entering the church. The church is also very nice, tidy, and with a rich history of Saint Spiridon. The devotion of this church and the pilgrims are impressive. This church contains the mummified remains of St. Spiridon. Many Greeks gather here to pay respect and venerate him as a saint. It is said that St. Spyridon saved Corfu from the plague in 1629 and officially became the patron saint of the island. The relic is exhibited in this small church is worth a visit. It is a registered trademark of the city and is very centrally located in the Old Town. The bell tower of the church stands out even from afar so there is no way not to find it. It is near shops, market, and restaurants as well. The patron saint of the island is adorned with beautiful frescoes and a magnificent dome of paintings created by Panagiotis Doxaras. The beautiful murals and carvings on the ceiling convey spiritual devotion for those who believe. It has many levels with wonderful views from all sides. It is the official reference point for the city. The cannons and other features Old Fortress Corfu will make you feel that you are in the era of knights. The fort is linked to the island with a military bridge over the moat of Contra Fosa. The sights to see are: The Portal, the library, the church of St. George, The University Music Faculty, the clock and the peak. Do not miss the view from the top of the city's castle and a large part of the island. It needs strength and time to discover and understand the history of Corfu behind this fortress. Undoubtedly the old fortress is the jewel of Corfu and one of the "heavy" attractions. With the abundance of military architecture, it guards not only the city, but also the Adriatic Sea for over 600 years. The old Venetian Fortress of Corfu is built on a rocky peninsula with two characteristic hills overlooking the eastern edge of the city. The fortifications were built in an important historical period during the 15th century. During this historic era, the fortress went into three phases of construction. The Byzantine period, during which the early settlers fortified the west hill (Castel Vecchio), the early Venetian period when the peninsula became an island and fortified the western hill (Castel Novo) and the Late Venetian when it completed the fortifications and took the present form in order to face the new threat of the modern era. Inside the Old Fortress of Corfu are preserved buildings constructed by the Venetians and the Englishmen. You will see the first Venetian prison (1786), which was subsequently extended by the British into two English barracks (1850) and a military hospital, which houses the department Music Studies of the Ionian University. You should definitely visit the Doric church of St. George (1840) and the remarkable collection of Byzantine icons and mosaics. To the north of the Venetian citadel is Mandraki, a small port where the moat surrounding the Old Fortress is now a safe anchorage for fishing boats. The Liston combines nobility and beauty and can be found at the beginning of the Old Town, in front of the Lower Square in the town of Corfu. It is a very beautiful promenade designed in European style that now houses stylish and expensive cafe and restaurants under the arches. It is designed by the French engineer Leseps and follows the standards of the Parisian Rue de Rivoli, but it is much larger in length and has more buildings. When Britain occupied it, the British stopped the grandiose and ambitious architectural projects in French. However, Liston remained an iconic symbol in the center of the country, which in the old days were allowed to frequent only the noble-registered in Libro D'Oro, while Popolari watched from a distance. Today, access to Liston is free, although not in the expensive shops on the ground. Enjoy the walk and proceed with pride to the Esplanade, the Old Town or Faliraki, while passing by this mansion and beautiful area of Corfu. In modern times, it is a simple pedestrian street with many cafes, bakeries, restaurants and pigeons. Day and night are the same if you go, but a visit is a must when in Corfu. The Paleokastritsa Beach is one of the most beautiful beaches of north western part of Corfu. It is large in size and you can find available lounge chair or a nice spot to put your personal stuff. The water is crystal clear and you'll need a mask and flippers to visit or go snorkelling in the caves that are not far from the beach. Another option is to rent the boats that offer tours to the secluded beaches which are worth a visit. It is filled with lush vegetation simple bays to swim, clean sea, and several shops, restaurants, beach bars, etc., depending on what everyone is looking for. It also has a monastery on a hilltop with great views. It has incredible beaches and clear waters in a magnificent location combining sea and mountain together. On either side of the beach there are taverns and shops selling various items such as souvenirs, clothes, hats, etc. The site is famous for its cold waters. There is free car parking and it is approximately 25km from Corfu. It is very close from the last parking at the port of Paleokastritsa. It is accessible in five minutes by car and 10-15 on foot and passes on a cliff with vegetation. It has nice views of the blue Adriatic Sea and the city. The Paleokastritsa Monastery is very pretty and there is a small religious museum and an old mill that is perfectly preserved up to this day. The museum is filled with old priestly vestments, old manuscripts, books and gospels that are very old and with rare publications. In addition, there are some bones from the skeleton of a large whale that was once washed off the coast of Paleokastritsa. Finally, there is a small path that takes you to the highest point with a Greek flag and a cross, which has spectacular views of Corfu’s panorama. In summer, the refreshment area outside the monastery is open for coffee, but in winter it's closed. Kassiopi is a beautiful place with nice shops and cafes. It has natural beauty, though a bit neglected in the winter. It is worth visiting the Byzantine castle with spectacular views across Kassiopi and the sea. You will find the entrance of the castle between the narrow paths on the main street of Cassiopeia. It is a pleasant and clean beach with deep waters and white pebbles. The shops are quite expensive, especially during the peak season (summer). Situated on the northeast tip of Corfu and 38 kilometers from the capital island is Kassiopi, a community that is born as a fishing village and today is very suitable for tourism. The infrastructure is very nice, with a nice central square and a picturesque harbor where the country preserves the ruins of an ancient Byzantine castle built on Roman ruins. The whole area, which overlooks the Albanian coast of which you can enjoy a great view from the castle ramparts, is very green and pleasant. For lovers of the sea, there are three beaches right next to the village. The left side of Kassiopi is a pretty rocky bay where you can hire parasols and sun loungers in addition to being able to enjoy some water sports adventures. 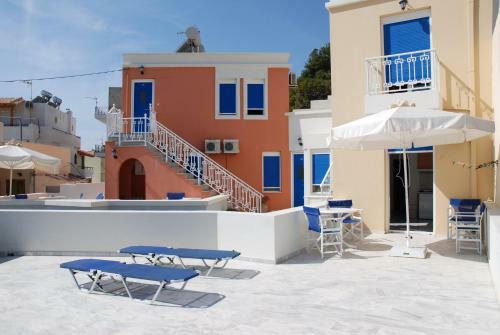 Barbati Beach is located just 30 minutes from the city of Corfu and features sun loungers and umbrellas for rent. It has incredibly clear water featuring cafes and restaurants. It is an ideal beach for swimming but there is difficulty in parking. The water is turquoise and deepens at a distance of two to three meters from the shore, so, no one needs to walk far to swim in the crystal clear waters. Access from the main road to the coast is relatively easy in many places. Near the coast there are a few taverns and bars, as well as thoughtful facilities with sun beds and shower, but there is a very large piece of coastline that is free from crowds and facilities. There are also platforms in the sea for anyone who wants to ski and try the water sports adventures featured here. After descending a very long staircase, your jaw will drop when you see the beautiful bay of the La Grotta Beach. The water is blue (or freezing) and it looks altogether lovely. For food, do not come here, they serve little and quite expensive, but the views are relaxing though. It has crystal clear water, a quiet beach without too much crowds and movement. 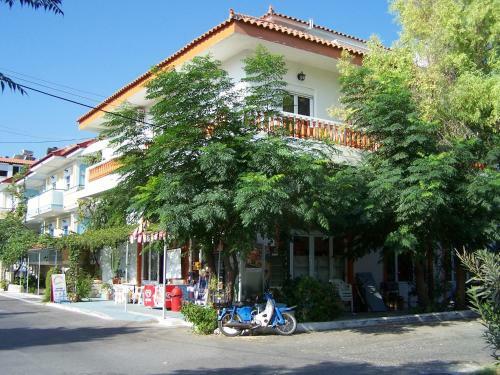 It has a few shops that sell sandals, towels, and other things that you need to enjoy your stay in the place. It is a sight that is well worth the visit even if you need to descend more than 100 steps. There is no beach, but in the shop one can leave their things for a swim from the rocks and then enjoy a coffee or a meal. Bring a mask and flippers to swim better through the rocks and enjoy the splendor of the magnificent seabed. The water is crystal clear and the view of the mountains right across the La Grotta is astounding. The Sissi's Palace (Achilleon) displays an immense amount of porcelain, silver and gold, in addition to the rooms, furniture, sculptures, and clothing and jewelery collection. One of the rooms is very extensive and requires a good pair of walking shoes to know everything, but it’s worth it. Upon leaving, you also need to explore a large garden to relax and enjoy the outside of the palace. Take the audio guide tour (comes in several languages) to help identify the most important items in Sissi's collections. The Achilleon Palace was the summer residence of Empress Sissi of Austria, with original paintings and beautiful pieces in addition to the exhibited collections. Among all of these, it is the Achilles statue, by which Sissi had a lot of admiration and the reason why the palace was named after it. The view from the garden is wonderful because the palace sits high and has a view of all sides of the island. The Kaiser's Throne is a unique place where you can enjoy the beauty of the island, to see the countryside and the green of Corfu (Corfu is often referred as the emerald island because of its lush vegetation all year round). When you go before sunset you can have coffee, food, and sweets at a hotel located at the back of the observatory. If you're in the area, it is definitely worth a visit because of the beautiful view. If you go there on foot, then do it in the morning when it is not too hot. You can also enjoy the sunset view from the restaurant. Corfu is an ideal beach holiday destination and any beach around here, no matter how small have its charms. The city is too beautiful, all verdant surroundings complemented by the crystal waters of the sea and sure to delight anyone the minute they see it even from afar. The best travel tip is not to rush things and absorb the surroundings, take time to socialize with the locals, learn their history and love for food, art, and the good life. The majestic panoramas, culture, art, and Mediterranean cuisine add more exotic touch and flavor to an exciting destination such as Corfu City.